Kingdoms is a fast-paced, strategic board game in which two to four players assume the roles of rival kings trying to increase their wealth by establishing castles across the land. By building castles in the richest regions, you stand to reap the most rewards. But build carefully! The most sought after regions may be infested with dragons, trolls, and other hazards that seek to rob your kingdom of its riches. 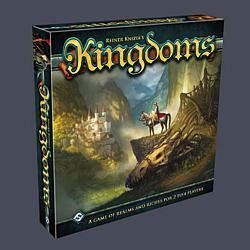 First published by Fantasy Flight Games in 2002, Kingdoms has been updated in a comprehensive new version, which features detailed plastic castles, a streamlined ruleset, and other welcome game enhancements.